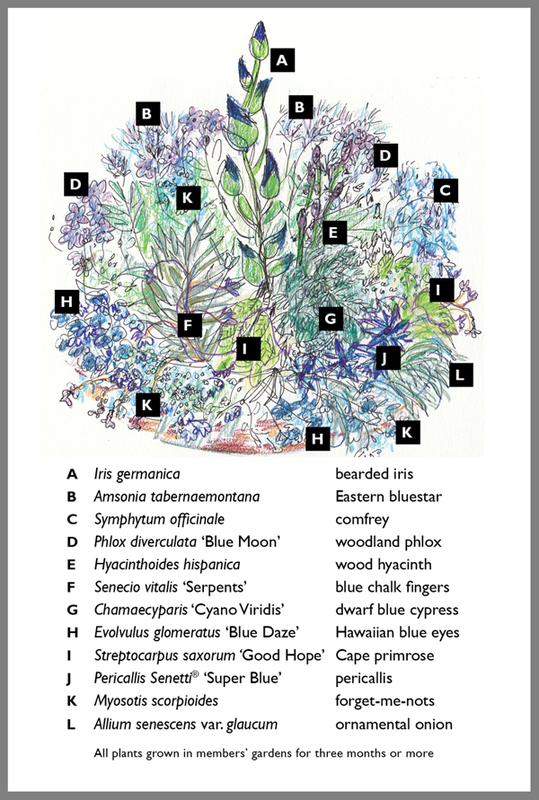 "June in the Country," the Cut Specimens class, included perennials, biennials, bulbs, corms, rhizomes, tubers, roses, woody plants in bloom, and plants grown for foliage. The Millbrook Garden Club, a member of the Garden Club of America, held a GCA Zone III Flower Show at the Interlaken Inn in Lakeville, Connecticut, June 21 to 23, 2011. The purpose of a flower show—entries are judged by expert teams and various prizes are awarded—is to set standards of artistic and horticultural excellence; to broaden knowledge of horticulture, flower arrangement, and conservation; and to share the beauty of a show with club members and the public. The theme of the Millbrook show was “Country Life,” and each of the classes, or entry categories, had its own specific requirements related to type of plant(s), growing conditions, ownership time, and size of arrangement or container. 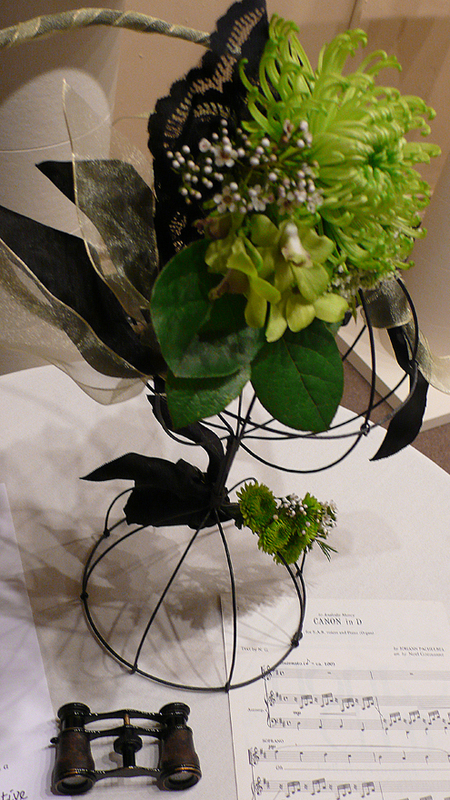 Garden Club of Irvington members entered and won prizes in a number of classes. GCI president Barbara Defino showed several outstanding cut specimens. Her ‘Red Sentinel’ Astilbe (above left) won a First Award, or blue ribbon, as did her achillea milleforium ‘Paprika’ (not pictured), and her Hydrangia x macrophylla ‘Penny Mac,’ (right) won a Second Award. The lipstick on the glass was a conversation-starter . All photos are judged according to a number of criteria and must be 100% the work of the exhibitor. In the “Locally Grown” class of the Photography Division, GCI member Doreen Ruff garnered an Honorable Mention for her portrait of a white anemone (lower left — see a close-up on the Photography tab). GCI's contribution of spireas for the Plant Exchange, propagated by members under the supervision of Hort Chair Nora Galland. The Plant Exchanges at Zone Shows give different clubs the opportunity to swap plants propagated by members. A Live Oak propagated from an acorn by GCI member Bunny Bauer (center, in square green pot) received an Honorable Mention. Each club was required to enter one tree propagated by a member in the “Walk in the Woods” class. Guests enjoyed the outdoor display of "Milking Time" mixed container plantings. 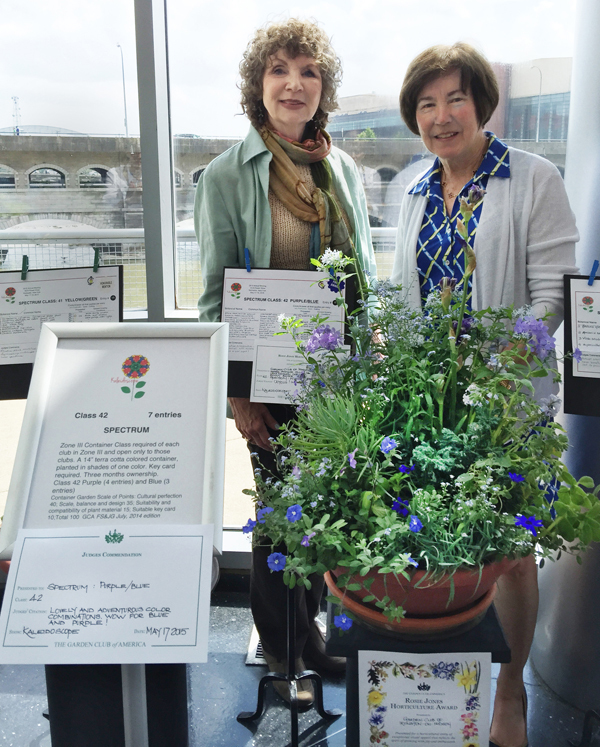 Ellen Shapiro of GCI got an Honorable Mention for this "Milking Time" entry of at least three white flowering plants of different genera in a 16-inch terracotta container.